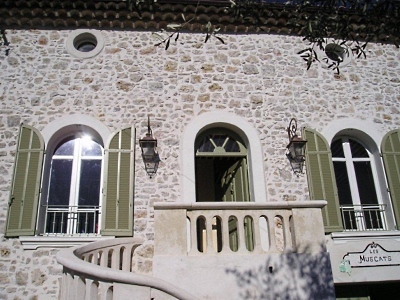 Tasteful property with a large, lovely garden in exclusive Mougins. 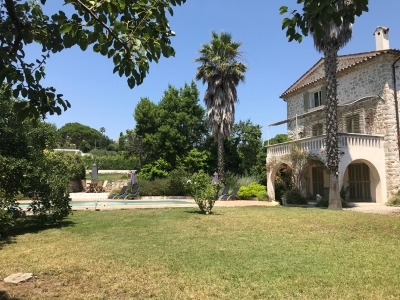 Like a cream cake this classic stone-built house rises behind tall iron gates in one of the best villa areas of Mougins. A beautiful, villa with fantastic garden and generous pool area with outdoor terraces. 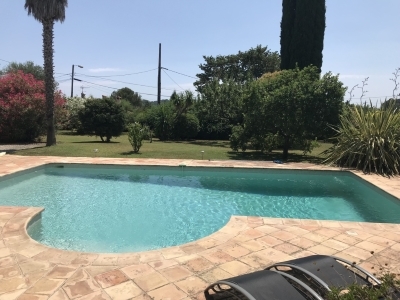 From here you have views of both the sea (5 min from Cannes beaches) and the beautiful mediaeval village of Mougins with some of the Riviera’s most well-known restaurants. 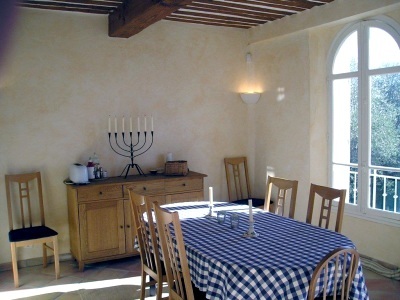 The house is tastefully decorated with exclusive materials in a modern Provencal/Scandinavian style and offers total comfort for 6 people. 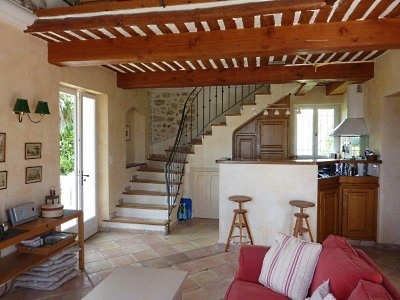 A wonderful holiday home if you want to be close to everything and yet live in style! Suitable for: 1-2 families or 3 couples. Rooms: The house consists of 3 floors. The ground floor has one bedroom with a double bed and with its own access to the pool and garden. Private and undisturbed. The first floor consists of a main entrance with salon, dining room and kitchen in a generous open plan arrangement and fantastic ceiling height, along with 1 bedroom with wide bunk beds and toilet. From the salon the doors open on to a large terrace with outdoor dining area. The second floor has an open and light entresol and a large master bedroom with bathroom en-suite. 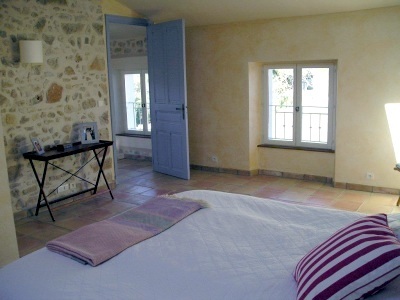 Standard/style: Newly renovated, modern Provencal style with touches of Scandinavia. 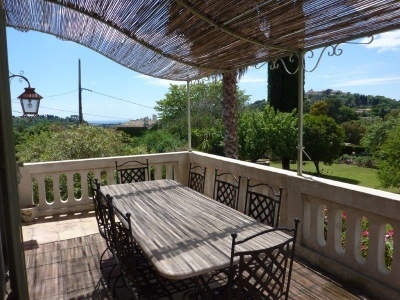 View: Sea view towards Cannes and a beautiful view of Mougins hill and the old Mougins village. Garden/pool: Large generous garden with beautiful trees and flowers. Flat, child-friendly garden. Large newly-renovated pool with fine stone tiles and patios. Facilities: kitchen with dishwasher, microwave oven, fridge-freezer, washing machine, CD player. Location: Just beside classic Mougins Village. 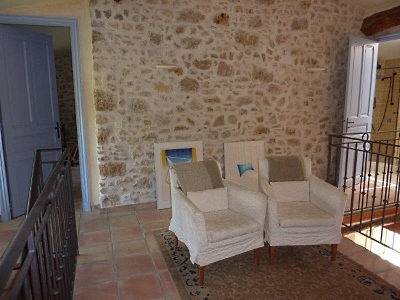 5 minutes from Cannes and the whole coast of beaches. 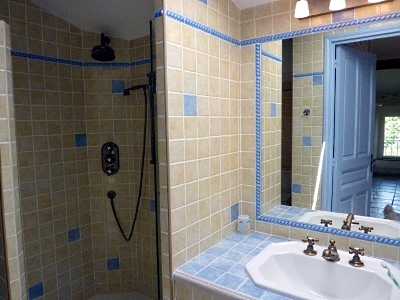 Quiet location in a classic villa environment, close to grocery shops, bakeries, etc. Entertainments/shopping: Mougins offers a multitude of restaurants (the Michelin-rated Moulin de Mougins is “next door”), galleries and small boutiques. In Cannes you can find everything, in the way of exclusive shopping, restaurants, night clubs and beach life. Golf: 10 min to some of the most attractive courses on the Riviera. Airport: 20 min from Nice airport. Can be rented at any time of the year. Arrival Saturday 16.00-departure Saturday 10.00. Dogs are unfortunately not permitted. Please avoid smoking indoors.